John Swope’s camera is astoundingly delicate. It can turn the geometry of the scene into a phase of light, or light equidistant to illuminate the scene, it can record an actor or an actress (Rosalind Russell, Norma Shearer, James Stewart, Mary Martin) at rest or relaxed or preparing, or it can find in the same face the complete role it has in view (Marlon Brando as Mark Anthony, Henry Fonda as Mr. Roberts), and both views are equally revealing and new. Lt. (jg) Swope went into Japan among the first. He thought his camera (at first, among the freed prisoners of war) might not realize on film the experience of the moment he was part of. That is a touching admission in his lengthy, detailed and eloquent Letter from Japan accompanying his photographs (turned down by Bennett Cerf). 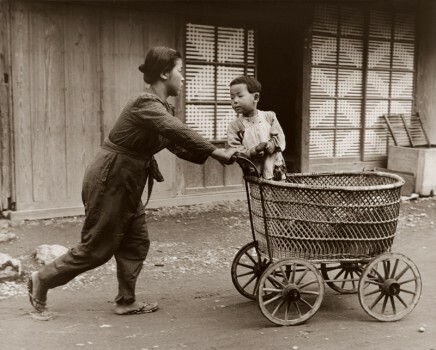 Swope in countryside and villages shows Japan its own countenance. In bombed-out cities and towns, the ruination of its labors. In the Chinese forced laborers, the state of prisoners under the regime. In the prisoners of war, a nation of free men about to shake off the trammels of servitude. 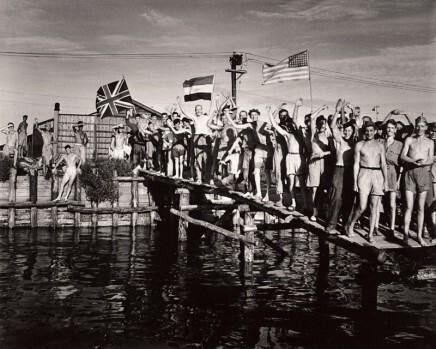 Three weeks in Japan, from the end of August into September, 1945.